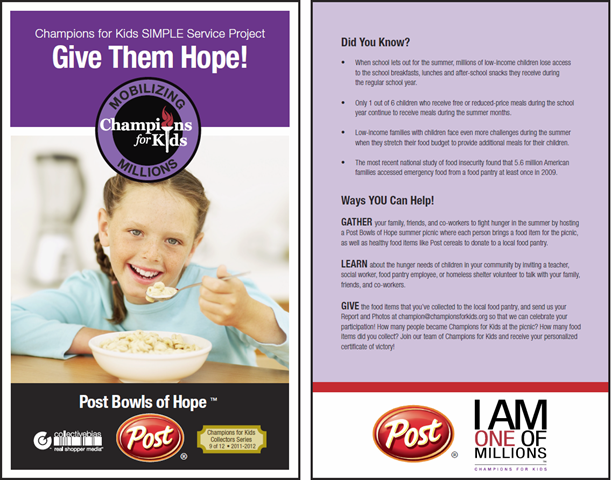 Champions for Kids: Give Them Hope! • When school lets out for the summer, millions of low-income children lose access to the school breakfasts, lunches and after-school snacks they receive during the regular school year. • Only 1 out of 6 children who receive free or reduced-price meals during the school year continue to receive meals during the summer months. • Low-income families with children face even more challenges during the summer when they stretch their food budget to provide additional meals for their children. • The most recent national study of food insecurity found that 5.6 million American families accessed emergency food from a food pantry at least once in 2009. GATHER your family, friends, and co-workers to fight hunger in the summer by hosting a Post Bowls of Hope summer picnic where each person brings a food item for the picnic, as well as healthy food items like Post cereals to donate to a local food pantry. LEARN about the hunger needs of children in your community by inviting a teacher, social worker, food pantry employee, or homeless shelter volunteer to talk with your family, friends, and co-workers. GIVE the food items that you’ve collected to the local food pantry, and send us your Report and Photos at champion@championsforkids.org so that we can celebrate your participation! How many people became Champions for Kids at the picnic? How many food items did you collect? Join our team of Champions for Kids and receive your personalized certificate of victory!